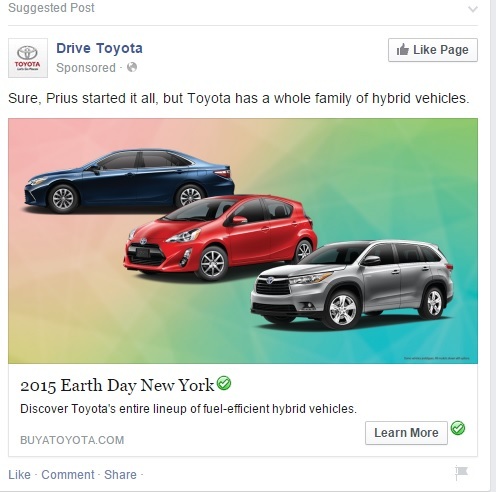 In my FaceBook Feed this AM–‘buy a car, save the planet’. Jesus wept. This was what Teed me off this AM. As my pals spend their days protesting about Earth Day(I attended the BP protest Monday AM and I’m still waiting for my clothes to dry), the marketing geniuses of the industrial world seize upon the meme of environmentalism to SELL MORE CRAP. Don’t get me wrong, I’m pretty sure Toyota sells a great product. And buying a Toyota probably gives you cred to sneer at others who are still tooling around in Humvees. And after going car-free since 2006, it’s clear I’ll be joining the Asphalt Nation crowd soon. I despise cars and the way they entitle ordinary carbon-based smart apes like us to behave (if pointless double-parking ever becomes an Olympic sport, several someones from my ‘nabe will medal). But my hand is forced by the collapse of NY’s mass transit grid. Real estate prices have pushed people into far bigger commutes from the outer boroughs than the people who designed the subways ever envisioned. And when GM ripped up the trolley system, they didn’t replace it with the intra-borough network that was lost. Exhibit A, the quickest way to get from my nabe to Bushwick is by taking a train all the way into Manhattan and then taking another train back out. It’s crazy to own a car here; but thanks to the official inattention to mass transit, it’s becoming crazy to NOT own a car. NY’s grid is a full topic for another time, though. not a believer in zombies, but sometimes the stupidity feels the same as the zombies. 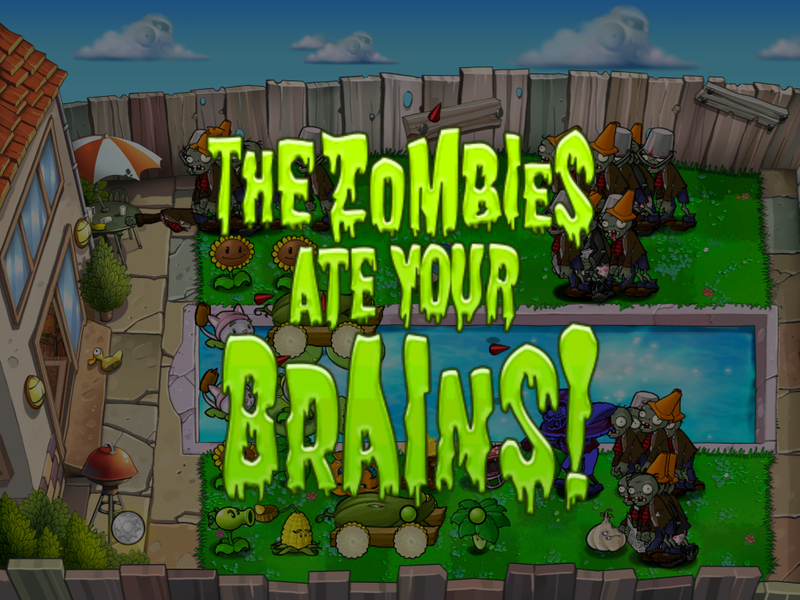 Screen dump plants and zombies. Nowhere is this a more valid than US observance of Earth Day. It was a really big deal when it started, and it was all well-intentioned. But it has been devalued and co-opted so much, it doesn’t mean anything anymore. I got several ‘Earth Day Sale’ emails from companies that sell crap. It’s well-intentioned crap (snappy t-shirts and books and CD’s by caring people like the hapless clueless hippie teacher on Beavis & Butthead) but it’s still adding to the world’s garbage pile. And how about all those ‘save the whales’ t-shirts, videos, plates, keyrings, etc.? Donate to the cause if you want, but the last thing you should do to support the whales is buy more crap that will go into more human landfills. Having a big meal for Earth Day? Just remember that in the US, we’re ‘eating’ ten calories of oil for every calorie of food thanks to our highly-processed and transport reliant agriculture. And school kids in NY State hardly know about Earth Day–they’re stuck in all that hyper-valuable ‘assessment testing’ during the week in April, and God Forbid any teacher distracts them from getting high scores on the tests. And hey–take advantage of Earth Day to buy a new Toyota! This is a whole separate debate, but when it comes to the environment it’s hard to see anything about automotive culture that could be considered eco-benign. Electric cars are still getting power off the grid (many times from coal-fired plants). Their manufacture requires at minimum 21 barrels of oil each (probably triple that when you look over the lifetime of the car including placement of the carcass on a landfill somewhere). The rare earth metals that bring us electric cars are, umm, rare, and the mining of said metals is particularly dirty and nasty. And remember, even a car that uses no fuel of any sort is traveling on a path of oil in the form of asphalt. Then there are the cars that use gas, contributing to more c02 and air and thermal pollution. And the kicker is that e vehicles and high-mileage cars aren’t even supporting the road grid (they aren’t paying gas taxes commensurate with use)–most of the money that keeps those highways up is coming from the general tax fund, and you’re on the line for the costs even if you don’t own a car. Sorry if I’m ranting. As I have written before, my protester friends are heroes to me. They do the heavy lifting and they risk arrest to remind the rest of us that the status quo can’t hold. And we’re probably on a countdown to extinction in any case– if you’ve read my other posts, you may intuit that the evidence is becoming increasingly hard to avoid. At this point in our history, it’s hard to look at Earth Day as a celebration of anything but lost opportunities to remind us that the planet’s biggest enemy is our need to consume more than we need.